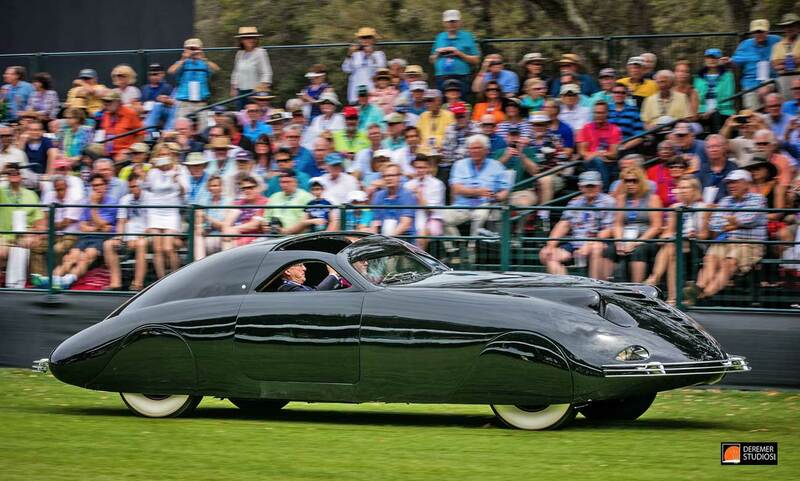 One of the most striking automobiles to grace the lawn at the Amelia Island Concourse d’Elegance this year was without a doubt the one-of-a-kind 1938 Phantom Corsair. The Corsair, which rarely leaves its home at the National Automobile Museum in Reno, Nevada, due to its international draw, has been written about many, many times before. But here at The Old Motor, we have gone the extra mile to bring you some new insights and perspectives on this magnificent, well-loved automobile and its designer. So, please read on…. 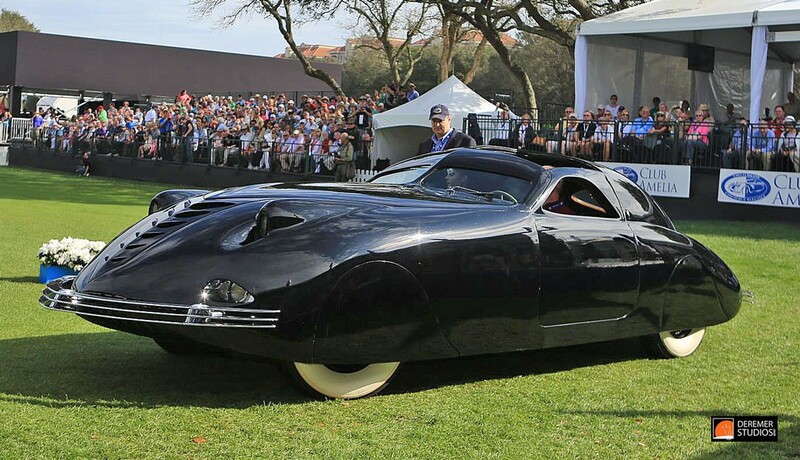 The lead image and this photo show the Phantom Corsair at the 2016 Amelia Island Concours D’Elegance only eight days ago. The photos are courtesy the Concours and Deremer Studios. Sometimes called the “Flying Wombat” due to it being dubbed such in the Hollywood movie, “The Young in Heart” (1938), the Corsair was designed by Rust Heinz, heir to the Pittsburgh-based food empire (think pickles and “57 Flavors”). Envisioned by Heinz as the “car of tomorrow” – a term that at its heart denoted the type of automobile that everyone would drive in some distant future (if only!) – the Corsair is a wonderful combination of extraordinary vision, mesmerizing looks, and utter impracticality. Heinz was a mere 21-years-old (!) in 1936 when he began his passionate quest to build his definition of automotive perfection. His parents, however, were far from thrilled with his plans to construct the Corsair, which had prompted the young man to drop out of Yale around his sophomore year as well as discontinue his studies in naval architecture at the Westlawn Academy of Yacht Design. The latter must have been particularly surprising to his family, for up to that point he had spent most of his spare time designing and racing boats. 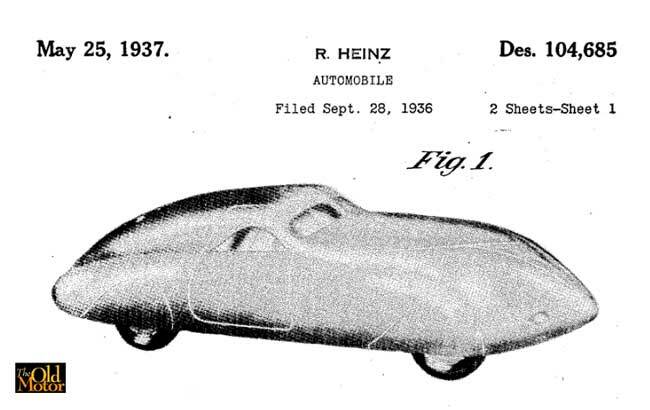 But according to a press release Heinz later circulated, he gave it all up, including the family business, to pursue a career in automobile design. Fortunately for automotive history, an aunt living in Pasadena, California, apparently felt differently than his parents about her nephew’s ambitions. So, and in what must have been considered a familial coup, she provided the young designer the funding he needed for the car project. Soon, Heinz was living on the west coast. A different front-end design is witnessed in this sketch created by Rust Heinz in early 1936 – around the time he commissioned the Corsair. In addition to the financial support the move provided, Heinz could not have been better situated geographically in order to pursue his goal. Among the many superlative coachbuilders in California was Bohman & Schwartz (B&S), who, it just so happened were also located in Pasadena. B&S was responsible for numerous custom automobile bodies for Hollywood stars, and Heinz soon contracted them to craft his Corsair. Upon commissioning B&S to handle the Corsair’s construction, Heinz purchased a brand new (and rather expensive) front wheel drive 1936 Cord – a car noted then and now for its impressive beauty and advanced engineering. But like many designers, Heinz believed he could do better. So, the Cord’s Gordon Buehrig-designed body was removed and sold, and the chassis and its 288 cubic inch displacement, 125 horsepower Lycoming V-8 were deposited at the B&S facility. A photo of the Rust Heinz and a sketch of the Corsair, taken at the young designer’s Palm Springs, CA, retreat in early 1936. The spectacular body that Heinz developed for this chassis was the result of a great deal of development. 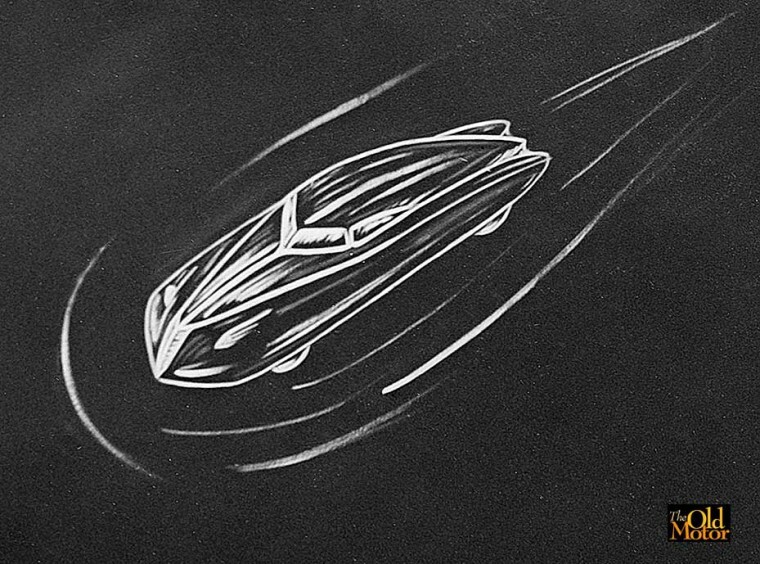 As with most automobiles, the Phantom Corsair’s life began on paper, and Heinz was reported to have been sketching his concept for a good many years before the project began in earnest. A recently discovered photograph of the designer shows him with one of these sketches at his Palm Springs, California, retreat – where he actually designed the Corsair (he would later open a studio in Pasadena) – in March of 1936, around the time he commissioned the car. The drawing shows that the Corsair’s general overall theme and shape were already determined. 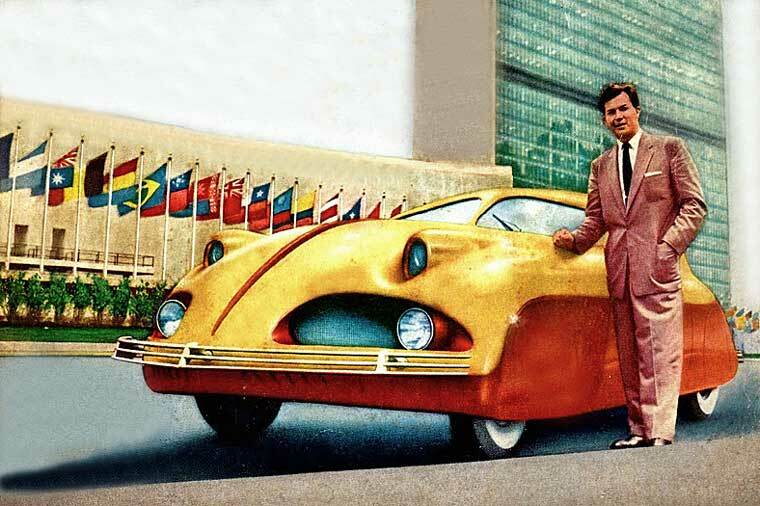 Yet, the front end it suggests (and we say “suggest” because the drawing is not clearly rendered, thereby obscuring Heinz’ full intent) is not the smoothly arched version we know and which famed design educator Strother MacMinn described in Special Interest Autos in 1973 (SIA #17) as one of the few original front end designs in the history of the automobile. Maurice Schwartz hand carved this model in 1936 to prove the Corsair’s design prior to construction. Heinz had it painted charcoal grey metallic sometime before his untimely death. No. Instead we find a front end that appears to resemble an inverted “T,” and comprising this form is a somewhat traditional upright grill and sweeping lower form with pie-shaped headlights (accented with graduated “speed stripe” ornamentation lines) wedged between the hood and fenders. The door glass, too, lacks the bilaterally symmetrical profile the car was finalized with, displaying a more standard airfoil or “teardrop” type of window treatment commonly found on automobile and airplane “greenhouses” of the time. Remarkably, Heinz’ ideation sketches were reputed to be only the beginning of the Phantom Corsair’s body design development. He also claimed to have made a number of clay models of the car that were tested and adjusted in a homemade wind tunnel. And to say that Heinz’ effort in this regard was extraordinary is an understatement, because 1.) despite looking speedy, few streamline automobiles of the era in the US or abroad are actually known to have been designed with the aid of any tunnel at all, and 2.) the use of clay in a wind tunnel instead of traditional, static wood, allowing for quick modification of the form, was essentially unheard of at the time. To give an example, in the same year Raymond Loewy claimed that his use of clay in a wind tunnel for designing smoke stacks to sweep away cinders from his streamline Pennsylvania Railroad K4s steam locomotive was an absolutely revolutionary technique. Even with all of his work, though, the success of the design cannot be fully credited to Rust Heinz. As MacMinn emphasized in SIA (and as we witness above), Heinz’ vision “must have been clear in his own mind,” but his drawings and models were not entirely successful in communicating his ideas to others. 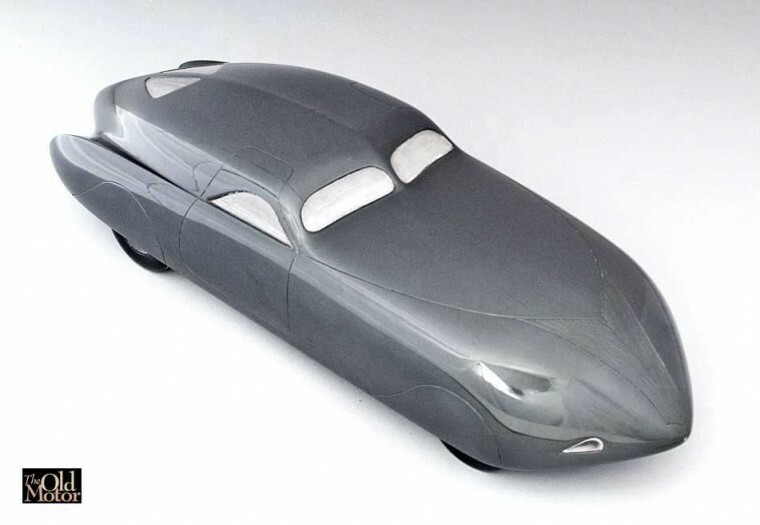 The final finessing of Heinz’ concept, MacMinn credits to Maurice Schwartz of Bohman & Schwartz, a superb craftsman who was apprentice trained in coachbuilding in his native Germany before landing in America. In order to “prove” the Phantom Corsair’s design prior to construction, Schwartz carefully carved at least one scale, mahogany wood model. 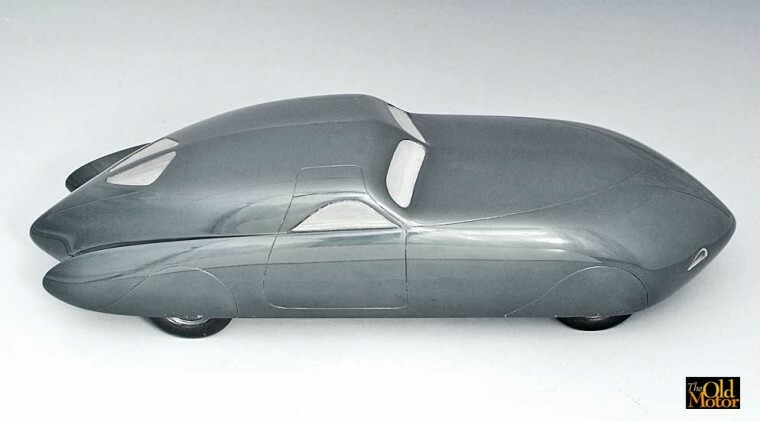 This model, which still exists and was formerly in this author’s collection (now in the Petersen Automotive Museum), was used, it is believed, to loft the design into full scale. It deviates from the finished product’s shape only in its style of grill and lack of the towering, inset headlights. The lights, by the way, resemble the popular Woodlites or the era but are actually normal lights with a custom, narrow opening. The teardrop shaped fog lights placed at the front corners, just above the bumper, help provide additional road illumination. Although the Corsair’s form received few changes from the wooden model, Heinz seems to have had great difficulty picking the final color for his masterpiece. Michael Lamm’s authoritative account on the Phantom Corsair (also in SIA #17, as quoted above), mentions that the car’s color was initially black but that shortly after its completion Heinz had it redone in a “desert sand” color. After being photographed, the images were then utilized in a sales brochure and in press releases as early as November 19, 1937 – a fact that, as an aside, may suggest that the car should be considered a 1937 instead of a 1938 (or even a 1936 if considered a re-bodied automobile, which are traditionally identified by their chassis year instead of their coachwork). But desert sand was clearly not the only color that Heinz was considering for his car. 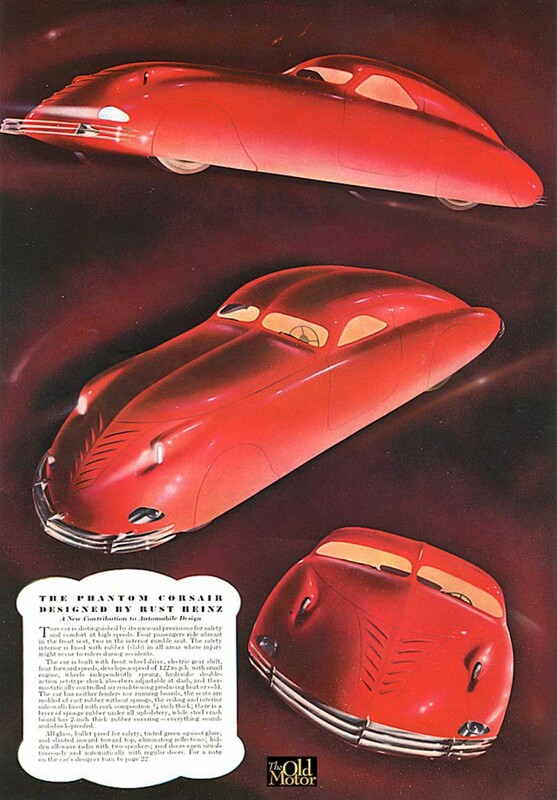 In a full-page illustration published in the July 1937 issue of Esquire magazine, the Corsair is featured in a bright red. Perhaps this choice was made because red is so eye-catching. Or maybe it was even an Esquire editorial decision. Unfortunately, there is no information to clarify the situation. One of Heinz’ patent application photos filed on Sept. 9, 1936 – the patent was granted on May 25, 1937. But what cannot be denied is that Heinz at some point had the Schwartz model painted the charcoal grey metallic it still wears today. Examination of the model shows that it was originally black, as MacMinn indicates Schwartz initially painted it. Some years ago, however, a color film of Heinz in his Pasadena studio in 1938 surfaced, showing the designer with the model in the gray metallic, thereby verifying the authenticity of the model’s present paint job. And so, one must wonder if Heinz had plans to redo the Corsair once more in this color had he not died tragically in 1939. On that latter subject, perhaps one of the greatest ironies of the Phantom Corsair’s history is that Rust Heinz had an immense interest in vehicular safety only to be killed in an automobile accident in a friend’s car. The Corsair’s interior as it was originally constructed was actually designed for passenger safety in case of a collision and, in practice, essentially equated to a heavily padded cocoon. This “safety interior,” as Heinz described it in Esquire magazine was “lined with rubber (slab) in all areas where injury might occur to riders during accidents.” Both cork and sponge rubber were utilized in Heinz’ system, and soundproofing was an added benefit. The root of Heinz’ interest in protecting passengers is unknown, but it may have stemmed from a boat race accident he experienced in 1935 that left him badly bruised. But whatever the reason for his effort, safety mixed with luxury and power were first and foremost on his mind when he pitched the car in Esquire. His very first line, in fact, touted that the Corsair “distinguished” itself from other automobiles “by its unusual provisions for safety and comfort at high speeds”. Part of that comfort was the ability to accommodate four across the front seat, including one to the left of the driver – only possible thanks to the Corsair requiring an incredibly wide body for the fully skirted front wheels to turn. This early promotional illustration of the Corsair shows it in a bright red color. Accompanying text promoted the design as a safety automobile – “Esquire,” July 1937. The Corsair’s interior as it exists today, it should be pointed out, is a pale comparison of its original incarnation—although deceptively so. The reason for such a statement is that the rubber-cork lining disappeared long ago. Yet, the partially incorrect interior it now possesses looks more original compared to most interiors of the era than as Heinz envisioned it. That is because the safety feature, as it manifested itself, consisted of a rather puffy-looking pleated headliner and under dash knee protection pad, the totality of which looks admittedly frumpy and incongruous when compared to the car’s slick exterior. Dan Palatnik digital model of the Corsair in dark grey metallic demonstrates just how it would appear. 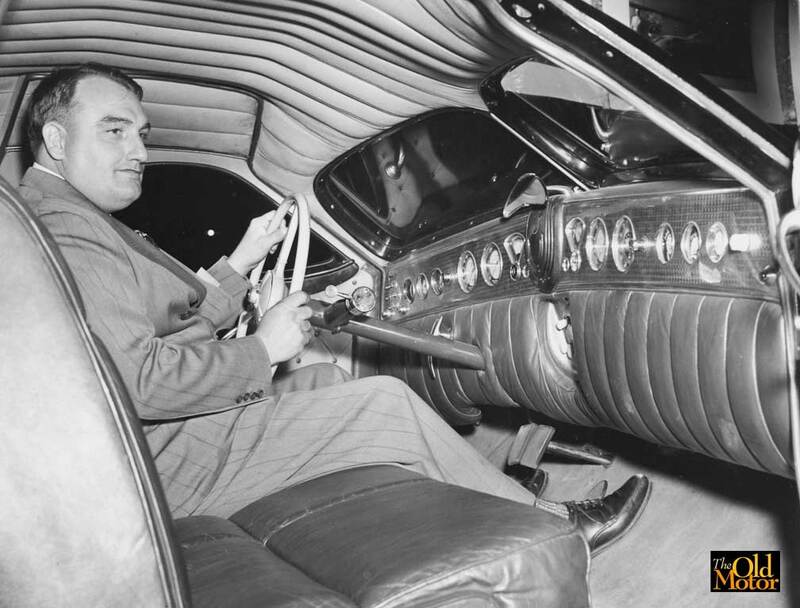 In addition to the padding, another safety feature that came into play was the use of bulletproof glass for the windshield, door windows, and backlight. The green tint, Heinz claimed, fought against glare, and being slanted “inward toward the top” eliminated reflections. The irony of using such glass as it turns out is that it was only available in very small sizes, limiting the dimensions of the car’s window openings. The result was poorer visibility in addition to the already terrible blind spots – some very anti-safety elements for the driver. But design is so often a world of compromises and contradictions, as scrutiny of the Phantom Corsair quickly reveals. The Phantom Corsair on display in late 1947, possibly at GRANCOR, the racing shop of the Granatelli Brothers. And yet, as flawed as his safety vision may have been, it should be noted that Heinz’ promotion of the concept, although nary recognized today, was quite unusual at the time. Preston Tucker’s similar efforts eleven years later are, for example, regularly lauded as absolutely visionary. Of course, the two men’s audiences for their product were quite different: Heinz’ aimed at the wealthy and Tucker’s towards the populous. But Heinz’ efforts and promotions do evidence that the Tucker ’48 was far from the first car safety conscious car, as well as reveals that the Corsair was more than just a mere styling exercise. Other changes affecting the originality of the Corsair’s interior aesthetic can also be easily witnessed in the car’s present form. The pricey tube radio originally mounted behind the knee protection – radios being a very rare car option at the time – has gone missing, and the speaker in the center of the dash has been replaced by a much loved and regularly photographed ca. 1950s multipurpose gauge. The engine turned dash plate that spanned the entire width of the car and mimicked the one found on the 1936 Cord has also disappeared. And a rather nifty pushbutton console has been added to the ceiling as well. Furthermore, Lamm reported that the interior might have originally been a red color. If so, it was paired with light colored, red button-pleated door panels, the color of which the author theorizes may have matched the desert sand exterior Heinz utilized in promoting his car. The interior it wears today is far more reserved in black, and features chrome buttons over smooth door panels. Designed as a “safety interior,” the Corsair’s insides were essentially a padded cocoon of cork and rubber. The car is seen here in 1944 with its owner, W. J. Stroh of Detroit. Admittedly, much of the Phantom Corsairs present non-original state can be blamed on Heinz’ choice of the 1936 Cord for its basis. The Corsair was claimed to have a top speed of 122 mph, bit if it truly did, it probably had trouble doing even acceptable speeds for any significant length. As advanced as the Cord chassis was for its time, the Lycoming V8 had a problem with overheating from the very start. The engine’s cylinder heads were reportedly redesigned numerous times to improve cooling during the short two years of the car’s production. So, one can easily imagine how Heinz’ super smooth front-end featuring so few louvers was a recipe for disaster. Thus, the Corsair was not particularly drivable from the very start, and changed hands quite regularly until 1951. It was in that year that the Corsair’s new owner, celebrity comedian and avid automobile collector Herb Shriner (who might be considered the Jay Leno of the 1950s; or perhaps more accurately, Leno the Shriner of our times) decided to do something about it. In what must have seemed a perfectly legitimate solution at the time, Shriner had Count Albrecht Goertz redesign the front end of the car for improved cooling. 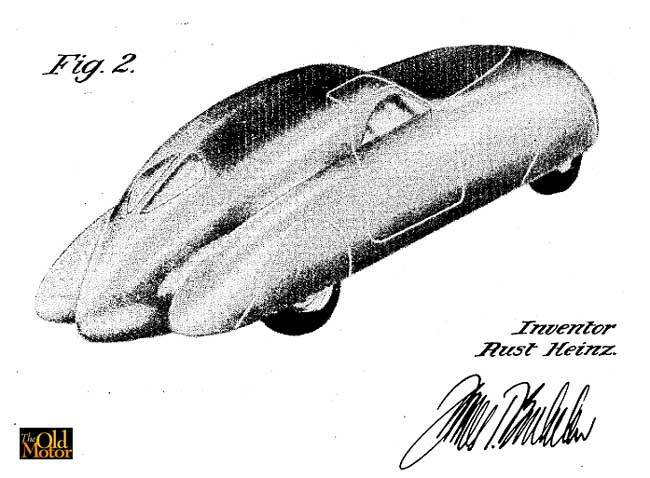 Illustration of Herb Shriner and the Count Albrecht Goertz redesigned Phantom Corsair at the 1954 International Auto Show in New York City. Goertz is best remembered now for his design of the iconic BMW 507. So, it is not as if Shriner had picked up just anyone off the street. But how do you improve on something that is considered nearly aesthetically perfect? In hindsight, Goertz did as good a job as anyone could have done trying to alter such a clean, unified shape. He retained the teardrop theme of the fog lights in the creation of air scoops. He also enlarged the windshield openings for better forward visibility. The small, hinged roof hatches that provided easier passenger access and that originally lifted upward automatically upon opening the door became much larger and now completely unbolted (as is remains to this day). And Goertz added a new two-tone paint job, beating out the soon-to-be-revived industry trend by a few years. Good or bad, though, there are likely few enthusiasts who are not thankful that Bill Harrah, upon purchasing the car in the early 1970s, mostly returned its exterior appearance to its original format. And finally, on the subject of wombats… while researching this article it was discovered that the term “flying wombat” appears to have originated with iconic comedian W. C. Fields in 1937, the year before the car debuted in “The Young in Heart.” It was in that year that Jimmie Fidler, a syndicated Hollywood gossip columnist told of his experience watching Fields being filmed. 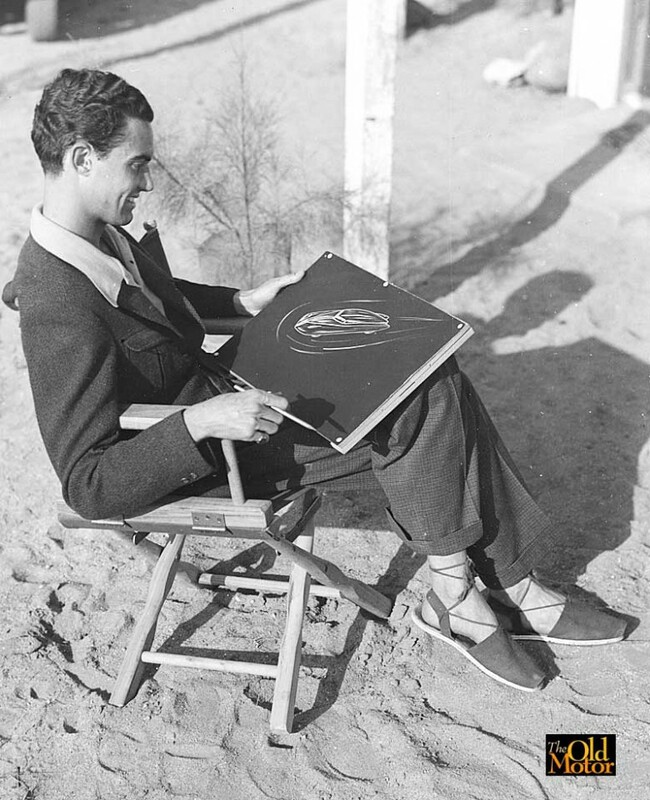 Fidler, explaining of how the star hated to follow his scripts, gave the following example to his readers: In one scene, Fields was supposed to say, “I was killing a snake.” Instead he substituted, “I was attacked by a covey of scorpions, and while I was fighting them off, a flying wombat got into my shoes!” The term must have been stuck in David O. Selznik’s mind as he filmed Heinz’ cherished automobile that year. A wombat, by the way (for those who are uninitiated), is a large, mole-like creature that is distantly related to koala bears. Indigenous to Australia, they have a pointed face and inset eyes that the Phantom Corsair does admittedly resemble. Check out some of the many Wombats videos that can be found online, and you will probably agree – especially if they possess black fur. This entry was posted in Auto photos 1921 - 1942, video and tagged "The Young in Heart", 1938 Phantom Corsair, Bowman & Schwartz, National Automobile Museum, Palm Springs, Raymond Loewy, Rust Heinz, wind tunnel, “Flying Wombat”. 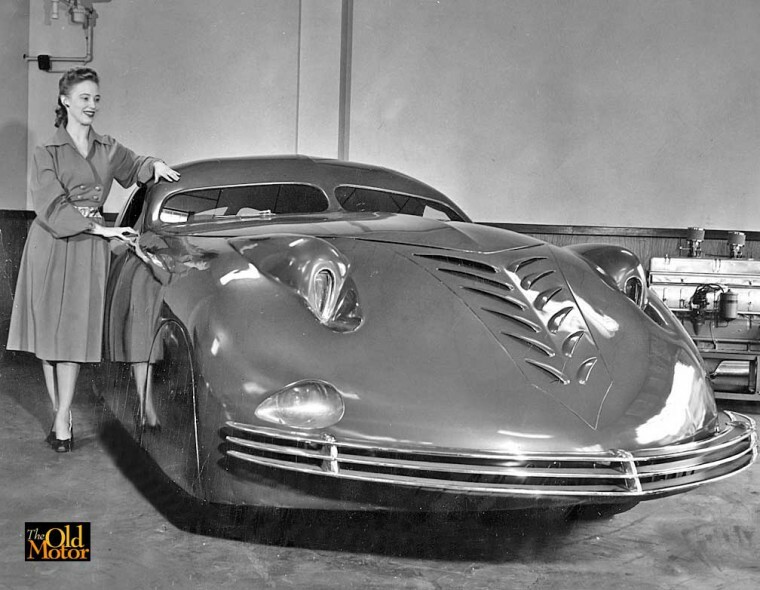 So Heinz’s vision for the car of the future was a streamlined FWD with emphasis on passenger safety. Sounds like he called it. Thanks for all the information – filled in a lot of blanks that I wasn’t aware of. While living in Reno about 1980, I took my visiting mom on a tour of Harrah’s Auto Collection. When we came upon the Phantom Corsair she immediately broke into a smile and related how she first saw the car as an eight year old, circa 1938, while living on the outskirts of Pittsburgh. She said it was as if a “Martian Mobile” had blasted past her while speeding down the highway! Thanks for this spectacular post! That Lycoming motor was built in my home town of Williamsport Pa.
Didn’t Hodaka make a dirt bike called a “Combat Wombat”? (In addition to its Road Toad and Dirt Squirt. Im just saying. Well done! Lots of great pictures and good research. Thanks for an excellent article. Herb Shriner, TV personality owned this car in the 1950’s . The interior reminds me somewhat of a Tucker. I loved this car 60 years ago and still do. Great article! I learned a lot i did not know before. 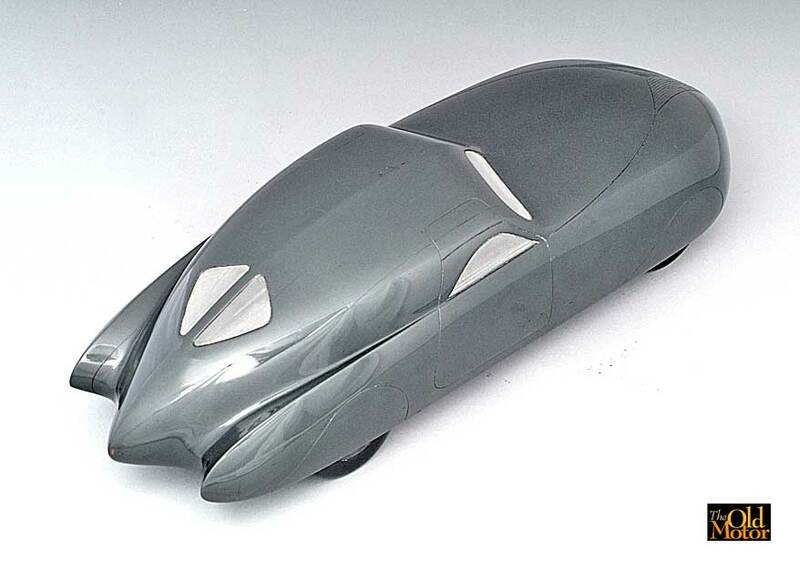 One little item, though…..the coachbuilder from Pasadena was BoHman & Schwartz……Chris Bohman (with an ‘h’) and Maurice Schwartz……just a tidbit for future reference. Chris, Thanks for catching the typo. Otherwise a great article. Thanks. This is a very fascinating article, I am wondering however if someone can help with a Question? In 1954 my family moved to Oakland California, and lived just off Mac Arthur Blvd at around 84th avenue. at that time there was a facility on Mac Arthur Blvd, at 82nd or 83rd called Joe Corsises (this may be spelled wrong) Cadillac corner. We lived there from 1954 until 1959 and I was 11 to 16 years old. Having been a car nut according to my father since the day I was born, I hung out there often as they had lots of wonderful cars, lots of Cadillacs etc. I remember that during this time they had a Phantom Corsair in there enclosed area of their lot. My question is was this a copy, I ask as it had the original nose, that the article says was removed in 1954 and not replaced until 1970s.I haunted this car facility and know that they advertised it as a Phantom Corsair, however as I recall the door windows were a bit different, but all else was the same as the original car. Every thing I can find says there was only one original, but were there copies? I know for absolute sure what I saw and once got chastised for touching it. I used to go in all the time and look at the cars and during the time the Phantom was there I went in often, actually until they chased me out and said I should not keep bothering them. Can anyone fill me in on the car I saw. It was around 1955/56 as I recall. Thank you all in advance, I have wanted to ask this question for years, as I can’t seem to find any info on copies of the original car. the one I saw did not have the big scoops in front, so could not have been the original during this time frame. I did see the car in Reno in the ’70s after it was returned to its original front. I actually thought it was the car I had seen in Oakland 20 years before. Ha..I love your little story, cool bean’s. Hot Wheels by Mattel made a black ’38 Phantom Corsair which was #3 of their 1999 First Editions series of 26 toy cars. The movie The Young in Heart is very enjoyable with Roland Young and Douglas Fairbanks Jr. as con men. A reformed Roland Young becomes a successful Flying Wombat salesman. Wombats are not “mole like creatures”, they are a distinct family of marsupials exclusively native to Australia only and are made up of three distinct sub groups. Their only similarity to moles is that they burrow underground. It always annoying how Americans continuously display their ignorance about our native animals. My grandfather is Wilifred J. Stroh pictured here, there is great deal of family lore around this car. I have some pictures of a newspaper article printed in the “Detroit Times” in April 1944, talking about the “two bars” in the vehicle and how it was designed for the executive as a luxury cruiser. I have never had the pleasure of seeing this car and would love to see the inside a bit more (and the engine of course). I believe 5 people (or 6 slim people) could comfortably sit on the front seat, with 1 person to the driver’s left, but only 2 sat in the back, on facing jump seats, due to a fully stocked liquor cabinet. This was in the days before drinking and driving were prohibited. Are there any photos of the back seat area available?